Canon is assuredly the brand most commonly found in the hands of the wildlife photographers (professionals as well as amateurs). Of course, this is a direct product of the strong presence of Canon on the market for digital SLR photography, but the diversity of the offer from the red brand allowed to build solutions perfectly tuned to the needs of nearly any photographer interested in animals and nature. The obvious priority of the amateur will be, for sure, to completely master his/her budget, while keeping in mind that wildlife photo requires a large focal length. 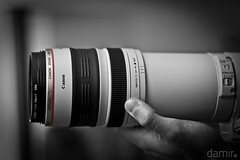 So, at Canon, there is no doubt about the lens to select; This will be the famous 100-400mm f/4-5,6 L IS USM. After all, for a price somewhat reasonable (taking into account the maximum focal length of 400mm), it is a good lens. Not perfect (it does not have the quality of the prime tele-lenses from the same brand and the maximum aperture has nothing to impress while still compatible with auto-focus), but terribly powerful (the focal length variation is done just by pushing the “pump“). The useful “pump” earns its name when working in a dusty environment. The sensor will be copiously dusted even without removing the lens from the body. The stabilization is using Canon’s first generation technology. It would be good to upgrade it now. But Canon does not seem to be ready to prepare a version II yet. This is all the more annoying because this stabilization has the bad reputation of breaking down (too?) often. And Canon, considering that this is a wearing part, excludes it from the warranty and will charge more than 400€ for repair. Last but not least, this 100-400mm also has the bad fame of being subject to sample variation in quality. Some go to the extreme of recommending not to buy it online without a return warranty. All in all, this is not a surprise that this lens is so frequently present in safari cars and in bird hideouts. In order to provide an SLR body up to the task, I would suggest the Canon EOS 60D (rather than the Canon EOS 550D) for its reactivity, its well contained price and its weather resistance always needed for outside operation. Moreover, the 18MP sensor will be perfect to support significant re-framing without too much quality loss. As you will also take some time to do some landscaping, put a 24-105mm f/4 IS USM in your bag. It will ideally complement the tele-zoom in terms of focal length and it has a nice price. However, the expert photographer will not be satisfied with the quality of the 100-400mm (it shows its limits on the EOS 7D). He/she will look at the prime lenses. Canon has a superb offering but you need to have very deep pockets and strong shoulders to haul most of the L-series gear. Otherwise, there are some possibilities to check thoroughly, tele-lenses that are no longer in the news but which kept there excellent image performance. In order to keep a good coverage, I recommend to select the 300mm f/4 L IS USM and the 400mm f/5,6 L USM. These two lenses are often ignored (the 400mm because it does not have the image stabilization) but they have optimal quality). Their maximum aperture is nothing great but this won’t be an issue with the high sensitivity of today’s sensors. Moreover, they can accept the x1.4 focal multiplier (The focal doubler from Canon will be left alone because it degrades images too much). Now, about the body, Canon has exactly what you need to power these tele-lenses: The Canon EOS 7D. It brought a clear progress for auto-focus and continuous shooting to a range that was in dire need compared to Nikon’s most recent offering. Its ability to produce good pictures at ISO 1600 will be appreciated to compensate for the limited aperture of the selected tele-lens primes. The only thing left is to complement this with shorter focal length. The excellent 70-200mm f/2.8 IS II USM cannot be beaten. And we will add the nice EF-S 17-55mm f/2.8 IS USM which, while not part of the L series has the needed definition to correctly feed the strong needs of the Canon EOS 7D sensor. There’s more: The advantage of slightly old tele-lenses is that they are relatively easy to find on the second-hand market (for example on eBay). This will reduce the tab too; It was already climbing quite high. Now, we need to go from tabs to major invoices. The pro photographer has requirements widely over the limits of most wallets, even the more enthusiast ones. If you don’t want to be frightened here, you should no longer look at the prices: Most people will buy a car for the kind of prices we are going to reach to equip a pro wildlife photographer, but we cannot be greedy if we need top quality. Canon L-series tele-lenses are at the top of the shopping list. First and foremost, the 300mm f/2,8 L IS USM is king here. It has been considered by most reviewers as simply the best lens ever. The price is scary but the weight is also frightening: 2.55 kg / 5.6 lb. Its successor is coming around the beginning of 2011, with a slightly lower weight but the cost will climb toward 7000€. It will probably be associated to a superb 500mm f/4 L IS USM, despite being even heavier and more expensive; But you will feel like Michel and Christine Denis-Huot when they wander on the Masai Mara plains in Kenya. The recommended body will also be a Canon EOS 7D (Yes! It has seduced many pros including those mentioned above). But if you are attracted to large sensors, a Canon EOS 5D MkII will add very pro video capture. As before, the tele-lenses will be complemented with the 70-200mm f/2,8 L IS USM and EF-S 17-55mm f/2.8 IS USM. But, if you went the Full Frame way, you’ll need some changes. To start with, the 17-55mm wide-angle zoom does not cover the field of the large sensor, it will be replaced with a EF 24-70mm f/2.8L USM. Then, if you don’t want to compromise quality with a x1.4 focal multier, the 300mm and 500mm will probably be replaced with a 400mm f/2,8 L IS USM and a 600mm f/4 L IS USM. But the weight is becoming really astounding (prohibitive?) and the tripod is now unavoidable. It is easy to admit that the choice offered by the lens offering from Canon is impressive and this explains how anybody can find what they want, what they need, what they can pay.